Sea level rise is a real and growing issue in the State of Delaware. Over the next 90 years, a significant percentage—between 8 and 11 percent—of Delaware is at risk of being inundated. The threat of inundation has the potential to trigger reactions from some property owners that will seek to protect their interests. Thousands of these resulting individual, ad hoc decisions and non-decisions will make it difficult to carry out a unified strategy to adapt to the massive economic and geographic impacts sea level rise will likely cause in the State. It therefore behooves regulators, policy makers, property owners, and the public to begin to think about whether or not a unified strategy is best for the state and, if so, what that unified strategy should be. In 2013, the Coastal Programs Office of Delaware’s Department of Natural Resources and Environmental Control (DNREC) awarded the Clinic a grant to perform an analysis of legal tools that could be used as part a strategy for adapting to sea level rise. Eight Clinic interns and the Clinic Director spent nearly 1,000 hours analyzing Delaware law, laws and regulations in other states, cases, and secondary sources. 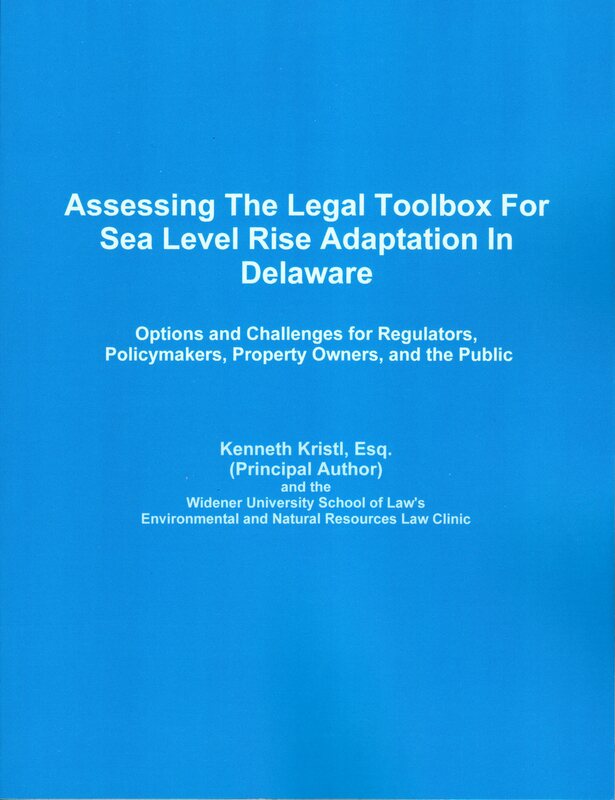 Their efforts resulted in the publication of Assessing the Legal Toolbox for Sea Level Rise Adaptation in Delaware: Options and Challenges for Regulators, Policymakers, Property Owners, and the Public. You can obtain a copy for download in .pdf format here. You can order a hard copy here. This Report/Book analyzes eight different legal tools that could be used to implement a unified adaptation strategy: zoning; acquisition and buyback programs; building restrictions/prohibitions; setbacks and buffers; conservation easements; rolling easements; transferable development credits; and real estate disclosures. The Report explains what each tool is, how it can be used as part of a sea level rise adaptation strategy, and general legal issues that use of the tool might raise (such as takings). 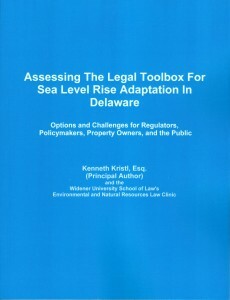 The Report then analyzes the current state of the tool under Delaware law, and provides recommendations for changes needed in Delaware law if the public and government officials wish to utilize the tool as part of a sea level rise adaptation strategy in Delaware. It is intended to facilitate the complex public discussion that must take place to make the hard choices that sea level rise demands. The Report was sent to local, county, and state officials throughout Delaware. Read the Law School’s announcement of that mailing here. The Report is also being provided to public libraries throughout the state. In addition to the Report, the Clinic conducted and continues to conduct public workshops. You can look at the materials from these workshops here. If you are interested in hosting a workshop, contact the Clinic Director.